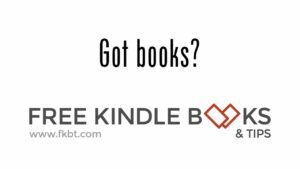 Here’s a quick reminder – if I or anyone else tells you about a book being offered for free on the Amazon Kindle website and you are interested, please jump on it immediately. Don’t wait a few days or even a couple of hours, or you may see the book being offered for sale vs. what you thought was free! I’ve seen it happen many times over the years. Why does that happen? Sometimes there is a glitch to the Amazon system, an author may have forgot to set the book for free, or who knows? Bottom line here is don’t wait – log on to the website frequently (www.fkbt.com) or check your email shortly after 8:00 a.m. Central time for the daily digest if you are subscribed to the free daily email. Grab them now as once the book is yours, no matter if you paid nothing or $100 for a book, it is yours forever! I should say something similar about books discounted to 99 cents: the author, for example, has told me their book(s) will be discounted for a particular day and I set the posts up in advance. The same issue that can cause titles to not be free can also apply to the discounting for a particular day. Please make sure you verify the pricing on the Amazon website before you click the “buy” button.